We woke on a beautiful bright Sunday morning, packed up all the “bits and bobs” as my English husband says, and headed west towards home! While in the Missoula KOA campground, one of the employees suggested to us that we shouldn’t drive over Lolo Pass towards Lewiston Idaho. He said it was twisty and that there was some road construction going on also. We thought it over, having just driven through the winding and steep roads of Yellowstone Park, and decided we’d go ahead with our plan… and oh my goodness, we were so glad we did. The scenery along this road (Idaho Highway 12) was so beautiful. I wish I had some great pictures to share, but I have only a few – due unfortunately to BUGS all over the windshield! 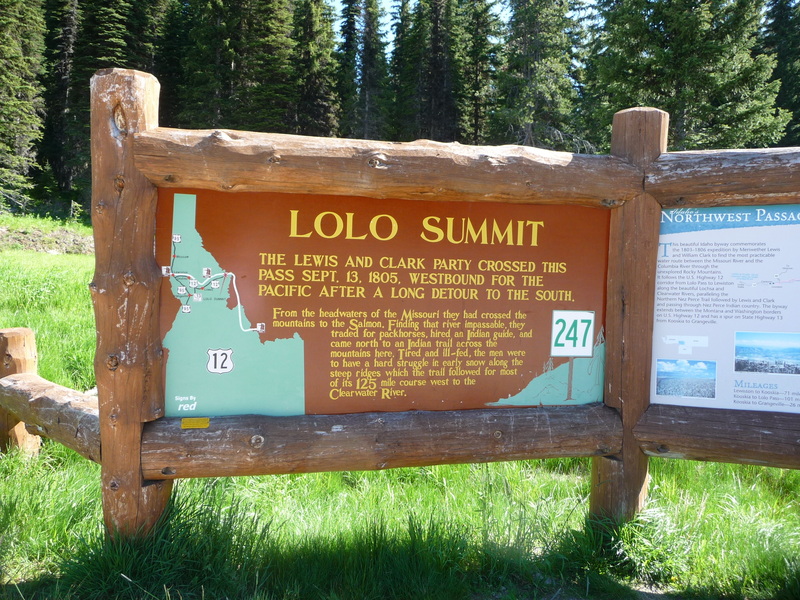 Here is a shot taken at the top of Lolo Pass, explaining how this road was one taken back in 1805 by Lewis and Clark on their quest towards the Pacific Ocean. There was a time in my life where I was super-interested in the westward movment of the 1800’s and I had read numerous books on the Lewis and Clark trail. Since hubby didn’t know much about all that stuff, he got an American history lesson whether he wanted it or not. Yikes, I hope I didn’t bore him with all that stuff. If I did, he hid it well – another big mark in his favor! I do love that man!! 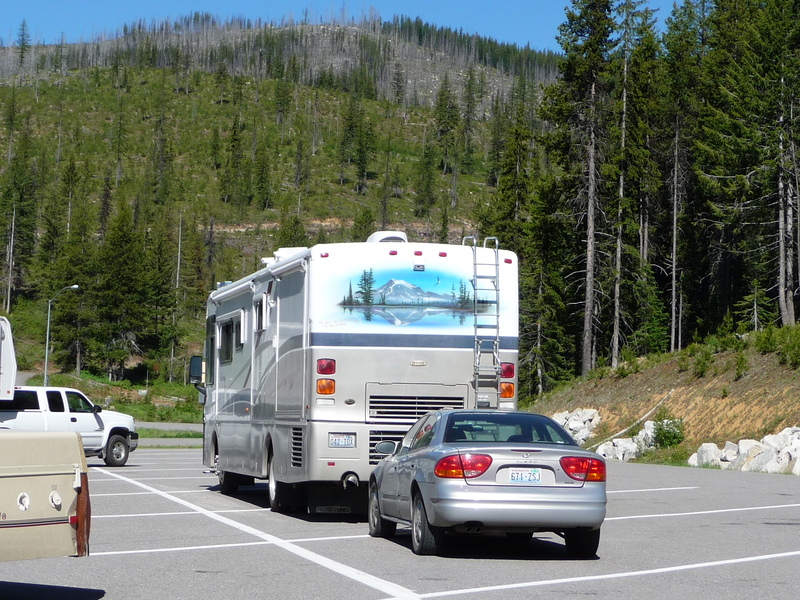 Here’s our rig, getting ready to leave the top of Lolo Pass and head on down the other side. It was not nearly as steep as many of the roads we’d navigated in Yellowstone – for the most part, we just buzzed along. My apologies in advance in regards to the next bunch of photos. Many/most were taken through the buggy windshield as we traveled along. 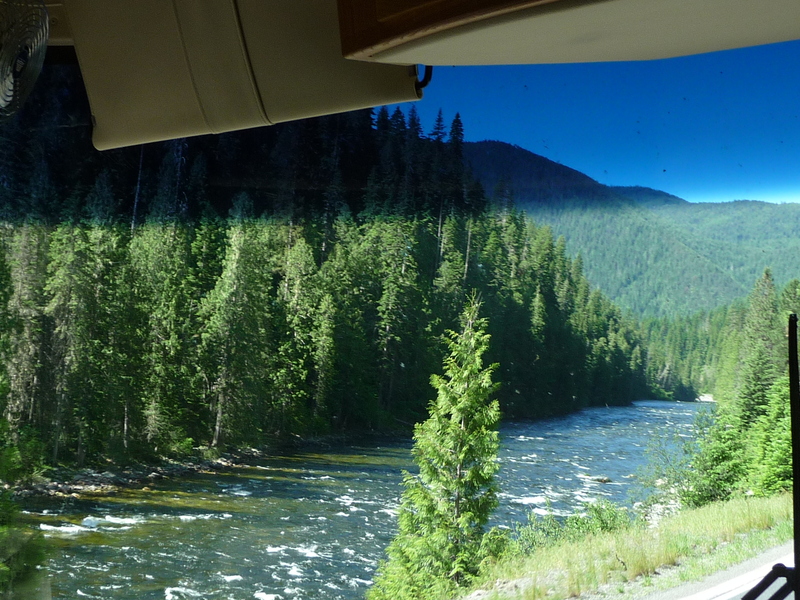 This one shows how closely the highway follows first the Loscha River and then further down the mountain, the Clearwater River. 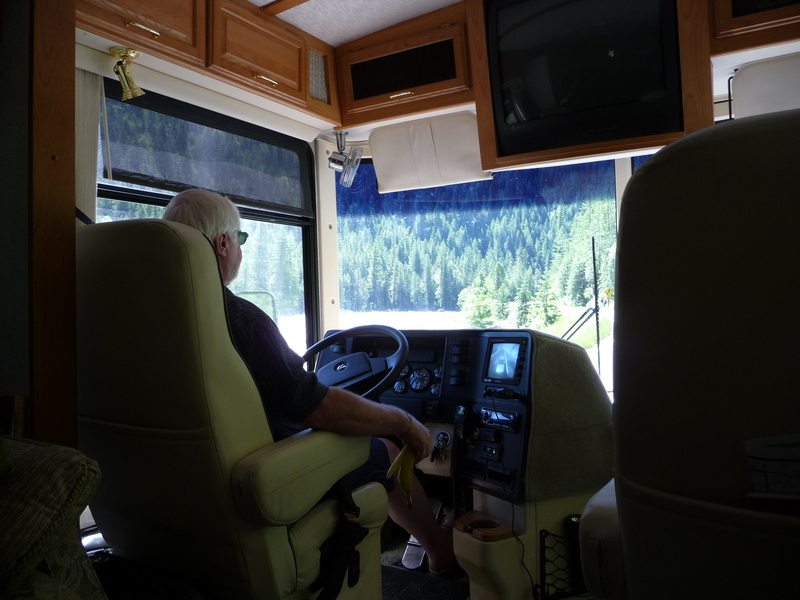 Here’s a shot of hubby in the pilot’s seat, doing a great job guiding our house on wheels down the highway. Note the little screen on the dashboard. That’s the “back up” camera, and he likes to leave it on to keep an eye on our car (also known as the ‘toad’) as well as the traffic coming up behind us. Unfortunately, the back up camera has a mind of it’s own and works when it wants to, and only then. It’s definitely one thing hubby plans to rectify once we get home. 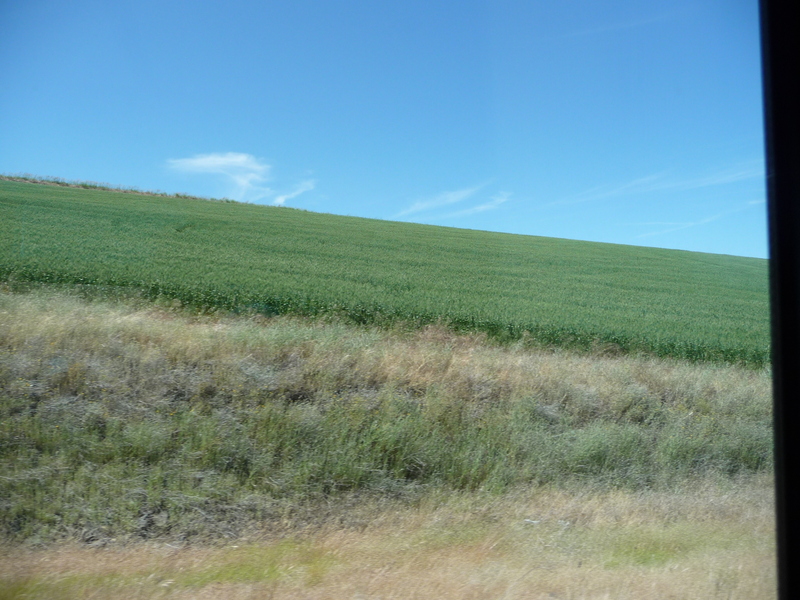 For those of you who think Washington state is all mountains and RAIN, here’s a snap of some of the farmland in far Eastern WA where lots of grain (mostly wheat) is grown. 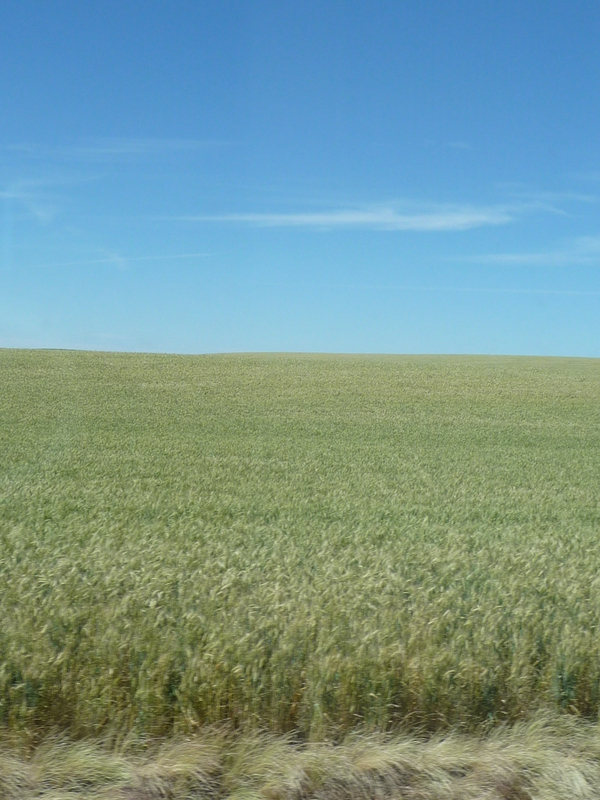 The wheat is about a month away from being harvested and hasn’t taken on that legendary amber color it’s known for – yet. These were taken as we approached Walla Walla, an area that is known for farming and now also for grape growing and wineries. The photo below does show some wheat that is getting close to being ripe. 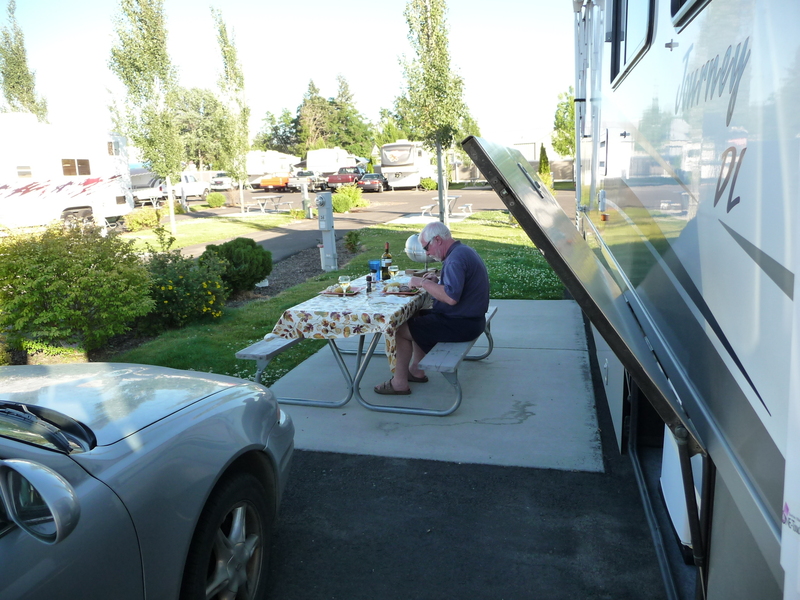 Here we are all set up at the RV park in Walla Walla. The weather was sooooo nice and warm, we decided to eat outside and barbecue a couple of steaks. When it came right down to it, I couldn’t eat the steak! I know this will sound absolutely NUTS, but while we were at a truck stop in Montana, gassing up, a trailer full of cows pulled up next to us. Okay, they did have a driver, we’ll call him “the cowboy”. Anyway… the trailer had holes in it and one of the cows kept peering with one eye through a hole at me… like he was trying in his best bovine way to say, “hey woman, you know where we’re headed, right? HELP US!!! !” I told John that after this “experience” I had with the cow, I wasn’t at all sure I was ever going to enjoy steak again. I’m thinking that maybe I’m over it already, because tonight we’re thinking about barbecuing a burger and darned if that doesn’t sound GOOD! I will try very very hard NOT to think about “Brownie the cow” when I’m munching on the burger. Seriously tho, I really DID feel sooooo bad for those cattle. Today we woke to another HOT one! After locating an RV parts store for some odds and ends, we began some wine tasting. Here’s a place we absolutely loved! And yes, we did indeed buy a bit of great tasting wine from these folks! One photo is the front and one is the side yard. 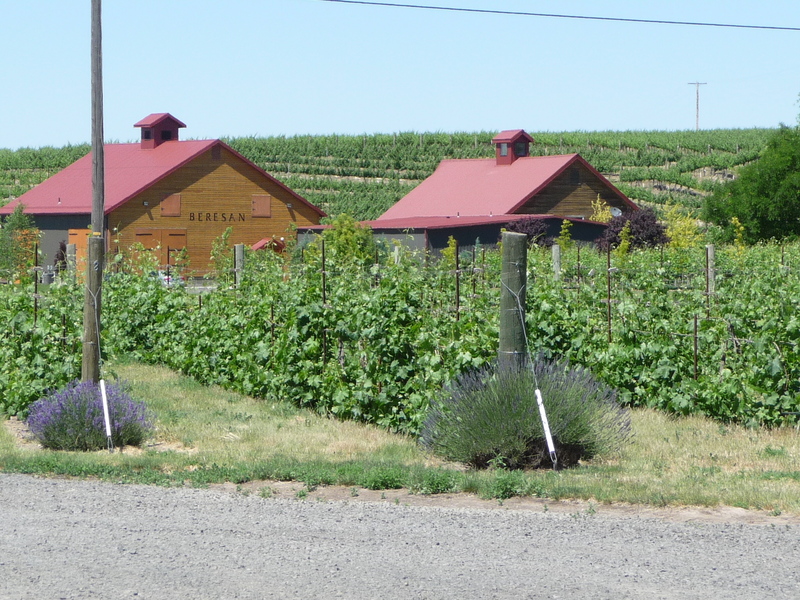 We have enjoyed wine tasting on nearly every trip we’ve taken. Most memorably in Australia, New Zealand, California, and right here in Washington State. 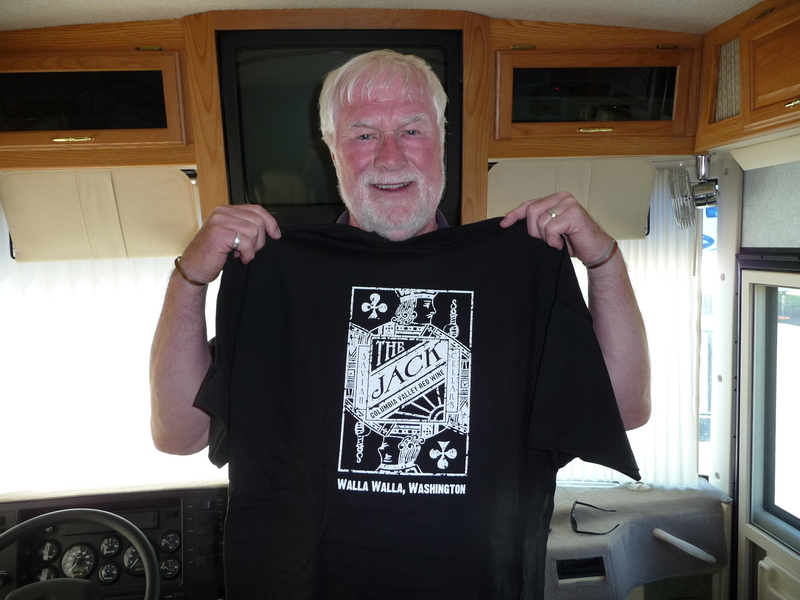 On a final note for today, here’s John with the t-shirt given to him by the Saviah Winery. So cute!! The shirt AND the husband 🙂 Well folks, we are about at the end of our Yellowstone-and-back adventure. 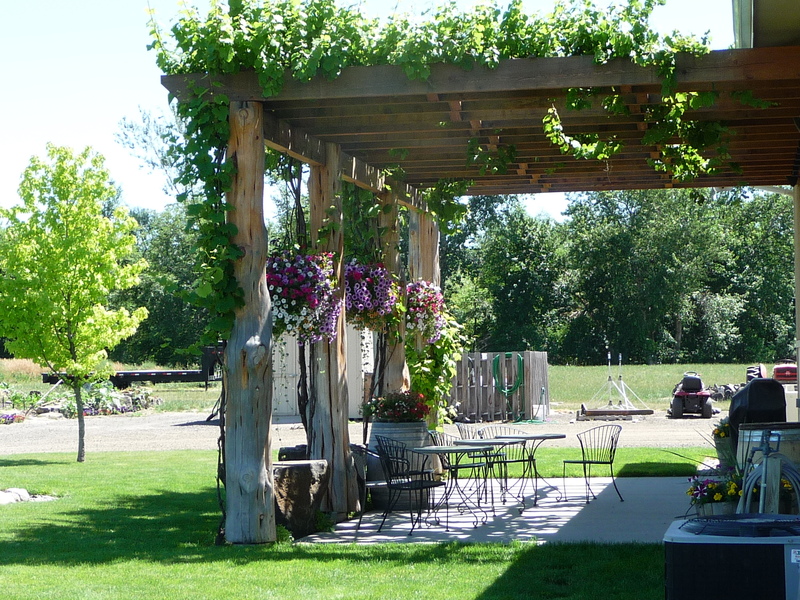 Tomorrow we head to Yakima to spend time with family for a couple of nights. Then it’s home sweet home. I will definitely be doing one last post with all the things I loved about RV’ing and some things I didn’t. And possibly some similar comments from hubby who has been an awesome chauffeur all across the West. See you soon! 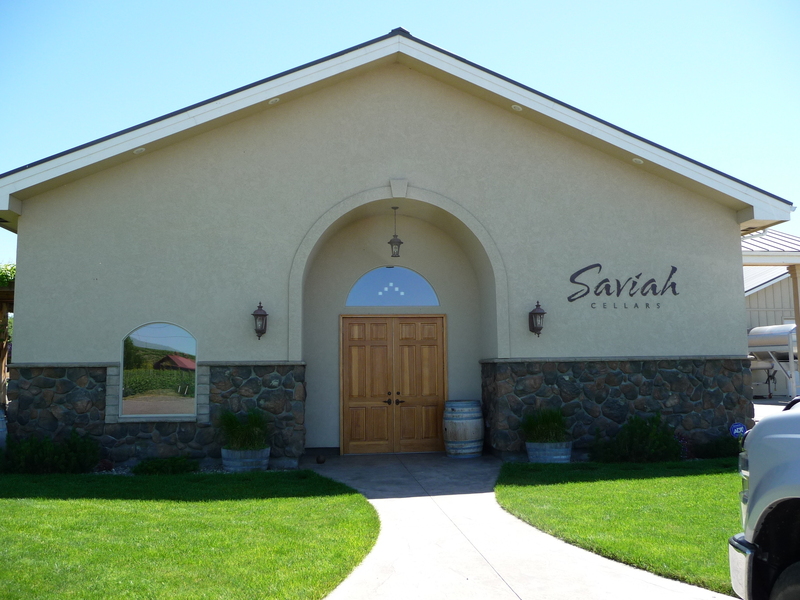 This entry was posted in Winnebago Journey and tagged Lolo Pass, Saviah Cellars, Walla Walla. Bookmark the permalink.